The Power of Makeup – Trish Mc Evoy Master Class at Nordstrom Oak Brook and Drinks at the Le Méridien. Learn how to perfect your make up techniques, just in time for all of the winter parties! Trish McEvoy has invited LGNN to be part of a The Power of Make Up Master Class. 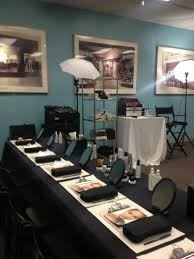 At this class you will receive a lesson on how to apply your makeup and then get a chance to try out your new skills. It is a fun event and a great way to learn new techniques or improve your ability to apply makeup. Bring a friend or a few (this event is open to non-LGNN friends as well). Proceeds from registration and a portion of qualifying purchases at event will be donated to Pillars. Please register by Thursday, December 7th. Since we will all look AH-MAZING… we will head over to El Tapeo, located on the 9th floor of the Le Méridien across the way for a nightcap!